The XV-15 research in hovering and tilt rotor aircraft lead to many breakthroughs for the aviation industry. 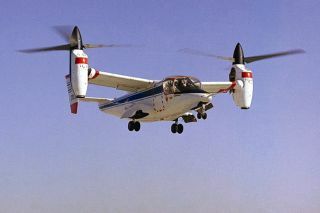 In this historical photo from the U.S. space agency, the NASA-Army-Bell XV-15 tiltrotor research aircraft hovered (1976) and then demonstrated conversion and forward flight (1978) as the first tilting rotor vehicle to solve the problems of "prop whirl." Through tremendously difficult research, the tilt rotor aircraft was able to combine the advantages of vertical liftoff and landing capabilities, which are inherent to the traditional helicopter, with the forward speed and range of a fixed wing turboprop airplane. This research can eventually lead to providing the aviation transportation industry with the flexibility for high-speed, long-range flight, united with runway-independent operations, thereby significantly relieving airport congestion. The research success so far has directly led to the V-22 Osprey development. For more information, please see NASA History Monograph 17, The History of the XV-15 Tilt Rotor Research Aircraft: From Concept to Flight by Martin Maisel.